It seems the left's establishment hammer has fallen once again. With the liberal media and its gaggle of talking heads and billionaires having destroyed Howard Schultz for daring not be an extremist and crushing Tulsi Gabbard's horror-filled anti-war stance, it appears it was the turn of Beto and Biden to face the ugly music. 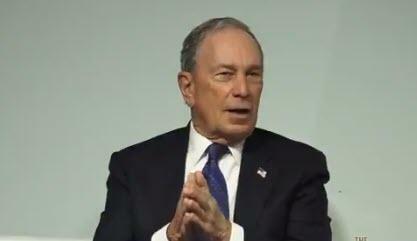 In a flip-flop that would make Fed chair Jay Powell proud, former NYC mayor Mike Bloomberg raged against his machine in a discussion at a Bermuda Executive Forum in New York City on Thursday - slamming the Democratic Party, Joe Biden, and even current golden boy, Beto O'Rourke. “To start a four-year job, or maybe an eight-year job, at age 79 may not be the smartest thing to do. But if I think if I thought I could win, I would have,” the 77-year-old billionaire said, adding that “I just couldn’t see a path to where I could get the nomination...unless I was willing to change all my views and go on what CNN called 'an apology tour'..."
“Joe Biden went out and apologized for being male, over 50, white,” Bloomberg, who funds several anti-gun initiatives, said. “He apologized for the one piece of legislation which is actually a pretty good anti-crime bill, which if the liberals ever read it, most of the things they like would be in that bill,” he said. “They should have loved that. But they didn’t even bother to read it. You’re anti-crime, you must be anti-populist,” he said. “And so everybody else, Beto, whatever his name is, he’s apologized for being born,” he said to laughter from the audience. “I mean, I don’t mean to be unkind. And a lot of people love him and say he’s a smart guy, and some day if he wins I’d certainly support him,” he said. O’Rourke has recently apologized for joking that his wife raised their kids “sometimes with my help,” and also has accepted criticism that he’s enjoyed white privilege. So with Democratic candidates being whitewashed left and right, who is the 'chosen one'? It is really going to be Elizabeth Warren?